“Just take crayons and enjoy nature. I’m sorry you asked.” I’m sure what she meant was “I’m sorry, you asked,” but all I could think of was “I’m sorry I asked too,” and I was that close to responding with that… Instead, I called it quits with social media, as I simply didn’t have the energy at that point in time. Fast forward to now, when we’re officially on the road for a year, and yes, we have brought a tablet, and are still enjoying the great outdoors, thank you very much. Some homeschooling parents, particularly older ones, are sometimes technophobes (notice I said “some.” My grandma is 88, a homeschooling supporter, and can use a tablet better than me). There are sometimes polarizing discussions about the use of technology in homeschooling, but really, it doesn’t have to be this way. There’s a time and a place for technology, and in some cases, technology can be an indispensable aid to education. As a matter of fact, as the world becomes more digitized, you’re doing your kids a disservice if you ban screens completely. 1. To aid with speech therapy. We’re still searching for the best android app to help with our son’s speech therapy (and we’re all ears if you have a suggestion), but for now, some of the apps we have do help a bit with his speech. We balance the use of screens for speech therapy with some manipulatives, and of course, lots of read-alouds, chances for practicing, and “games” for working on his DCD (which afffects the use of his jaw muscles). 2. To help with language learning. For my kindergartner, apps have helped her to be excited about learning new sounds and letters, and there are fun games that help her to retain the information. Yes, these games are available as board games as well, which we played lots when we had lots of room to store them. But in a small space, having several things in one small tablet is super convenient, helpful, and yes, an aid to our children’s education. Also, for my child with DCD, holding a pencil is extremely difficult. We help him develop this skill with he aid of pencil grips and lots of practice, but his ability to learn letters and sounds is well beyond his body’s ability to write them down. Using technology allows him to continue learning his letters and numbers before he has the full ability to write them down. 3. To help with foreign language learning. As we travelled through Quebec not knowing much French, the app Duolingo helped us learn some words and expressions that have helped us during our trip. It was a great supplement to the real-life learning we did while walking through small villages in Quebec, where not many people spoke English. We see the benefits of doing the real-life walk-arounds as well as having an app that helps us with memorization. Gasp! We also enjoy using the tablet for fun! Sometimes, after a long day of walking through the woods and sight-seeing, it’s fun to sit down with an electronic game. And that’s perfectly fine. For some, swearing off technology is a defining statement in the way they choose to homeschool. If that’s you, that’s fine. But it’s perfectly OK for other people to use technology in a way that suits their family. At the end of the day, we all chose to homeschool because we want an excellent education for our children, and different families will have different ways of accomplishing this end goal. If you’re on the fence about too much tech use, you can always create a digital sabbath for yourself: turn off devices for 24 hours. The trick with tech use is to not let it take over your life completely—but that’s true of anything. 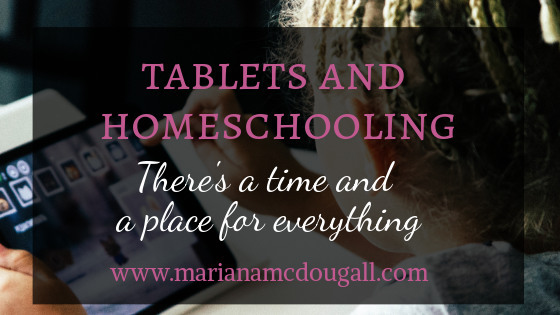 How do you use technology in your homeschooling?